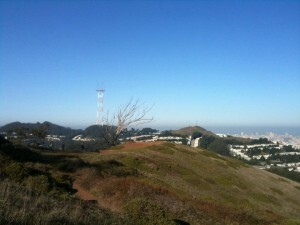 Mount Davidson is San Francisco’s natural highest point. If you can drive there and park your car in the street it will take you only five minutes to get to the top. There is a short trail that takes you up to a quiet view of the city and the ocean. 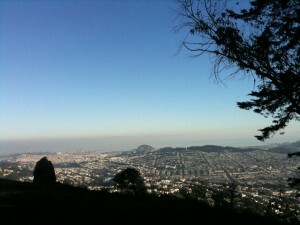 It seemed to me that all the tourists are busy going to Twin Peaks and Mount Davidson may be a bit forgotten. The hill is actually a few meters higher than Twin Peaks and not too far from the city. Perhaps I was just lucky to go on a bright sunny Saturday morning where only a couple of locals could be found strolling or walking their dogs. There is an improvised wooden bench nicely placed at the top of the hill and a skinny and unusual tree on one side of the bare top which is just spectacular for pictures.